Over the weekend, I made some tweaks to the Positively Present site (if you're viewing this in an email or a RSS feed, click here to check out the new look). 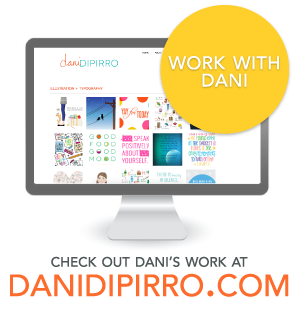 You'll notice a new logo (it's simple, but I've been working on it for weeks!) and some design changes to the site. I've been meaning to make these updates for quite some time (ever since I took the amazing Creating an Identity 101 course over at Nicole's Classes), but making the small yet tedious tweaks continually kept getting postponed, with "Website Updates" making my to-do list on a daily basis for weeks and weeks. I finally got around to doing it this weekend and, man, did it feel good to draw a line through that one on my list! As a drew a line through that to-do item, I realized that it wasn't just the act of completing the task that was making me so happy. My job was also brought on by the act of tweaking something I see and interact with every single day. As you may have read here before, I'm a big fan of my routines and change isn't my strong suit, but after revamping Positively Present, it occurred to me that maybe little changes—tweaks, if you will—are a great way to keep things fresh without the daunting task of tackling a big change. 1. Switch up your typical responses. When someone asks how you're doing, do you often reply in the exact same way, such as with the word "Fine." or "Great!"? Most of us have a pretty standard default setting for the way respond to questions we hear all the time. To switch things up, start altering your responses. Really think about the question and answer honestly. 2. Travel an entirely new way to school or work. It's common to take the exact same route every day (mostly because it's the fastest or easiest one to take! ), but what if you switched it up and took a different route? Even if it takes a little more time, it's worth traveling down a new road just to give your brain a new point of view to take in. You don't have to switch it up every day, but it's worthwhile every once and awhile. 3. Throw out / replace something you complain about. Is there something you're always complaining about? An appliance that doesn't work right? A shirt you don't like but for some reason wear anyway? Most of us have something like that—a thing we moan about but don't do anything about. Today, throw it out or replace it with something else. Sometimes our complaining is simply a habit—and it's up to us to change it. 4. Focus on doing one single thing at a time. If you're a notorious multitasker like myself, focusing on a single activity can be a big challenge—but it's a worthwhile pursuit. Apparently, studies have shown that you're more effective if you do only one thing. And, for most of us, intently focusing on a single thing is actually quite a novel activity in itself. Keeping your attention narrow gives you a chance to stay more present too! 5. Take a break at an unusual time and go for a walk. Being outside, even for a short while, seems to offer all sorts of benefits. Take a break at an unusual time—say, 10am instead of 1pm—and go for a short stroll. Switching up the timing of your break will break you from a rut, and enjoying the outdoors gives you an opportunity to appreciate the world outside of your daily routine. 6. Get into bed an hour earlier than usual. Like it or not, you need sleep. Most of us know how much we need, but rarely actually get that amount. Even if you can't fall asleep right away, getting into bed an hour earlier—with a good book or even a journal—can tweak your nightly routine and, if you're lucky and can fall asleep, it can also provide you with some additional rest. 7. Enjoy a meal you've never had before. It's perfectly fine to have culinary preferences, but there's something to be said for trying a new meal. Whether you order in or cook it up yourself, give something new a try. Even if doesn't make your list of favorites, the experience of trying something new will be invigorating and, at the very least, will help you switch up your routine. 8. Turn off the TV + pick up a book. Mindless television watching can be lovely, particularly after a long day, but tweaking your evening routine and throwing in a book (or magazine or something other than a screen) can provide you with a new kind of relaxation. Even if you're not a big fan of reading, just give it a try. You might find it surprisingly enjoyable, snuggling up with a good read. 9. Spend time with someone unfamiliar. Now, don't just go running over to some stranger to switch things up. It's important to spend time not with someone random, but with someone you know but aren't too familiar with, like a coworker you interact with frequently but don't know well. Ask him or her to grab lunch or coffee with you, even if it seems a little random. You never know when you might make a friend! 10. Reverse a habitual schedule. Do you have a pretty standard morning or evening routine? If so, trying reversing it. Instead of brush teeth—wash face—brush hair, try doing the reverse. Or if you normally eat breakfast at home, try grabbing a bite on the way to (or at) work. It might seem silly, but small little tweaks to your routines can be really useful, especially when it comes to being more mindful. Making tweaks in your daily routine seems so small (and almost silly), but it often has a big impact (usually in some odd and unexpected way). It's easy to stay on track by keeping things routine and sticking to what works, but even I, lover of routines, admirer of habits, can't deny that a small, simple tweak can have a big, positive impact. 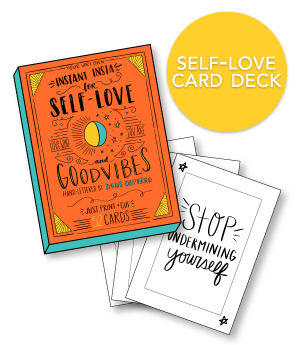 Give one—or all!—of these little tweaks a try to see if you experience something positive! Last week I took my puppy, Barkley, to her first day of Puppy Kindergarten (aka, puppy training classes). The school Barkley attends uses positive training, focusing on positive reinforcement such as praise, treats, and play to train dogs. (This differs from an older method in which dominance and punishment were used to get results.) As I watched all of the puppies in the room responding so well to the training (all the puppies aside from Barkley, who spent most of the class on my lap, afraid of the bigger pups), I realized how well positive reinforcement can work with humans too. Just think about how often you tell someone not to do something. Or maybe that's just people like me who tend to be a little, uh, bossy—to put it mildly. Anyway, it seems to me that, when it comes to communicating our preferences with others, we spend a lot of time vocalizing what we don't want and not all that much time praising the behaviors we do want. This ultimately causes us to give much more attention to the negative behaviors (just as the old way of teaching dogs did), leaving the positive behaviors without the attention they so rightly deserve. Positive reinforcement works so well in dogs (a—nd other animals) because they are praised and/or given a treat immediately after they do what you want them to do. They are encouraged when they do what's right and, as a result, they want to keep doing it. In some cases we do this with people—just think about how it feels to get a A+ on a test you studied so hard for, to receive a raise you worked years to obtain, or to hear the appreciation in someone else's voice when you do what was asked of you—but I don't think we do it often enough. Why not? Because it's harder than it seems. You see, often our gut reactions are often stronger when it comes to negative things—"Oh my god, no! NO! Don't put that pen dripping black ink on the couch!!! "—than they are when it comes to positive things—"Thank you so much for the flowers you brought home! So pretty! "—which makes it difficult to focus on positive reinforcement. It's our nature to avoid things that might harm us and we react quickly and harshly to behaviors that disappoint, annoy, or scare us. It's not necessarily a reflex to dramatically react to a positive behavior. Like most aspects of living a positive and present life, it requires effort to focus on positive reinforcement. It's not easy with dogs—just try not saying "no!" when a puppy is biting you!—and it's not easy with humans either. Here are some tips for using positive reinforcement. Keep in mind, this isn't about training humans; it's about reinforcing positive behaviors to create better relationships with the ones you love (or the ones you have to cope with). Offer a reward. Rewards work wonders for dogs, and they work for people too. When someone does something you really appreciate, show your appreciate with a reward—and keep in mind the kind of reward an individual would appreciate. You might like a nice bouquet of roses, while she would be more pleased with a handwritten note. Praise profusely. Maybe the "profusely" part isn't necessary, but don't forget to praise the behaviors you want to see more of. If your kid cleans his room (finally! ), tell him how much you appreciate it and how great you think it looks. Or if your boss goes out of her way to give you credit on a project, don't let that act slip by without some serious recognition from you. Praise, praise, praise! Focus on the good. Pay close attention to the behaviors you really want to see more of and focus on those more than the behaviors that irritate you. Randomly bring up a good behavior in conversation—long after it happened—just to show that it still means something to you. The more attention you give that behavior, the more others will realize how much it means to you—and hopefully keep doing it! Dig deeper. With dogs, it's important to look at the cause of a behavior. Puppies often nip because they want attention; when you yell "no!" as they nip, you're giving them exactly what they want. If you get to the root of what someone really wants (in this case, attention), you can give it to him or her in after a positive behavior (after a puppy sits calmly). Getting to the root of what someone wants can help you both create more positive behaviors. Be consistent. Even though humans are quite a bit smarter than puppies, they still benefit from one of the most important aspects of positive training: consistency. The more consistent you are with reinforcing a positive behavior, the more likely you are to see that behavior repeat itself. Keep up the praise, the rewards, and the attention to positive actions and you're much more likely to see more and more positive results. Avoid force/intimidation. This is one of the key elements of positive training for dogs and it can work wonders in human relationships too. People don't like to be bullied into doing things; they want to believe they did it on their own, without being forced into it. No matter how badly you want a behavior, don't try to force it or intimidate someone else into giving it to you. Manipulation is negative and will only lead to negativity in relationships. Decreases stress. One of the great stressors in any relationship is arguing over the behaviors you don't want. While, of course, you cannot ignore negative behaviors, having a large focus on positive reinforcement helps to balance out heated discussions about unwanted behavior. When you use positive reinforcement techniques, you spend much more time taking positive action—and less time stressing out. Builds up trust. The purpose of positive training in dogs is to build trust between humans and dogs so that the dogs want to do what the humans ask of them. Likewise, using positive reinforcement in our human relationships helps to build trust. Instead of constantly criticizing one another, we focus our attention on the behaviors we enjoy. We encourage and praise each other, creating a culture of trust (not fear) in the relationship. Creates good feelings. It feels good to praise someone—and it feels good to receive praise. Instead of using so many negative words, like "don't" and "no," when reinforcing positively, we're focusing on the good things, using praise and rewards and appreciation to get the results we want. In doing so, we're creating more good feelings than bad, creating more love and less hostility. Promotes positive action. Not only does positive reinforcement help to create more of the action that is positively reinforced, but it's likely to inspire others to find more actions that will garner positive attention. If you're receiving lots of great attention and praise for things you're doing right, aren't you going to want to find more things to do to get the good stuff? You bet you are! Positive action + positive reinforcement = more positive actions. Positive reinforcement requires a lot more effort than simply responding angrily when someone does something you don't like. It's so much easier to focus on berating negative behaviors than it is to praise positive ones—but positive reinforcement can reap some pretty amazing rewards, helping to create more positive and productive relationships. And positive reinforcement doesn't work only on other people and animals—you can also give it a try with yourself. Reward your positive choices! Praise your own good decisions! The more you focus on the positive, the more positive relationships you can create—with your pets, your loved ones, and even yourself. Last week I spent a wonderful, magical, amazing day at Walt Disney World for the first time! For those of you who might not know, I wrote my 300+ page Master's thesis was called From Biting the Apple to Breaking the Spell: Analyzing Love in the Disney Princess Collection and, prior to writing that in graduate school, I'd spent my childhood and young adulthood slightly obsessed with Disney's Alice in Wonderland—so I've always been a Disney fan. Despite my love of Disney, I'd never ventured to Walt Disney World in Florida until last week (though I have been to Disneyland on more than one occasion), and it was just as amazing as I'd expected it to be. "Follow your own advice" is a life lesson that's particularly close to my heart. Because I spend so much time writing Positively Present, I'm always offering advice—but that doesn't mean I'm always taking it. In Alice in Wonderland, Alice sings an entire song, "Very Good Advice," in which she says, "I give myself very good advice / But I very seldom follow it / That explains the trouble that I'm always in / Be patient, is very good advice / But the waiting makes me curious." Like Alice, I often know what the right thing to do is (especially when it comes to patience! ), but I don't always do the right thing. We could all learn a thing or two from Alice and pay attention to our own advice. It's always so much easier to give advice than it is to take it, but we all have instincts that really deserve to be listened to. The advice we give others (and ourselves) is often a result of an instinct we have, the deeply embedded knowledge of how to do the right thing. The trouble, of course, lies in following the advice. The first step to achieving success in this department is to listen to yourself. Pay attention to your own thoughts. And ask yourself, "What advice would I give a friend in a similar situation?" Then, just do it. No matter how dire Cinderella's situation gets—and, let's face, it's pretty bad—she never seems to give up on her positive attitude. If I had a wicked stepmother who forced me to work for her and made me sleep in the worst room in the house, you better believe I wouldn't be in the most cheerful mood every day (or ever). But Cinderella manages to stay positive no matter how bad things get. She's always singing a cheerful tune, treating the animals in the house with kindness, and even being respectful to her step-family. Staying positive under such unpleasant circumstances cannot be easy, but Cinderella serves as a perfect example for how a positive attitude comes from within. She owns few possessions. She's treated cruelly. She doesn't have any friends (other than her animal buddies). And yet she still manages to hope and dream and be happy. We could all learn from Cinderella's inspiring attitude. She doesn't let the negativity of others drag her down and she doesn't waste time moaning about how bad things are for her. She makes the best of every situation—no matter how terrible it is. Though I'm well-aware that the Disney version of Pocahontas is apparently a far cry from what actually happened, the concept of acceptance portrayed in the film is worth celebrating. In the movie, John Smith lands on American soil and accidentally encounters Pocahontas. Though they don't speak the same language or share the same customs, the two are able to connect with one another. They spend time teaching each other about their cultures. I'd imagine it would have been difficult for John or Pocahontas to grasp the concepts of each other's cultures, but they both make an effort to understand each other. When we encounter new cultures (or even just people we can't quite understand), we should take a tip from John and Pocahontas and make an effort to understand where they are coming from. Differences can be challenging at times, but they provide us with opportunities not only to learn new things about others, but also chances to learn new things about ourselves. In The Princess & the Frog, Tiana desperately wants to own her own restaurant. Unlike some of the other princess characters, she doesn't wait around for a prince or fairy godmother to save her. Instead, she works two jobs in order to raise enough money to turn a rundown sugar mill into her very own restaurant. Every day she is completely exhausted from all of the hard work, but every day she is closer and closer to her goal of making her lifelong dream come true. We often hear about people making their dreams come true, but we don't always get a feel for how much hard work goes into making a goal a reality. Very few people achieve great things without having to do any work. Tiana is a great example of how lots and lots of hard work is needed to achieve a goal—and she also serves as an excellent reminder for how things can work out for the best when you make a big effort to go after what you want. Achieving a goal is an amazing feeling—but it's not obtained without putting in the effort, and we could learn a lot from Tiana's perseverance. Though I'd never advise changing one's physical appearance to get a guy, as Ariel does in The Little Mermaid, I can't help but be impressed by her dedication and determination to get what she really wants—a life as a human. She spends her time daydreaming about life on land, collecting treasures from the forbidden human territory, and defying her father to venture up to the sea's surface. And she's willing to sacrifice a great deal to get her chance at being a human. No matter what she comes up against, she finds a way to overcome the difficulty, all while keeping her eyes on the prize. Even though she must go against her father's wishes and make some very big changes in her life, Ariel doggedly goes after what she wants. She knows what she wants and she's not afraid to go after it. Many of us are held back by fear—of rejection, judgment, the unknown—and, as a result, don't go after what we really want. Ariel has a great lesson to teach us all: if you really, really want something, go after it with every ounce of your being and don't ever, ever give up. Disney films are filled with life lessons and morals—and many of the messages are extremely positive. (There are also quite a few messages I wouldn't agree with, but we'll save those for another day.) We can learn a lot not only from Disney films, but from films and media in general. Pay attention to the life lessons in the media you consume on a daily basis, searching for positive life lessons. The more you look for them, the more you'll see them—and the more you'll learn!